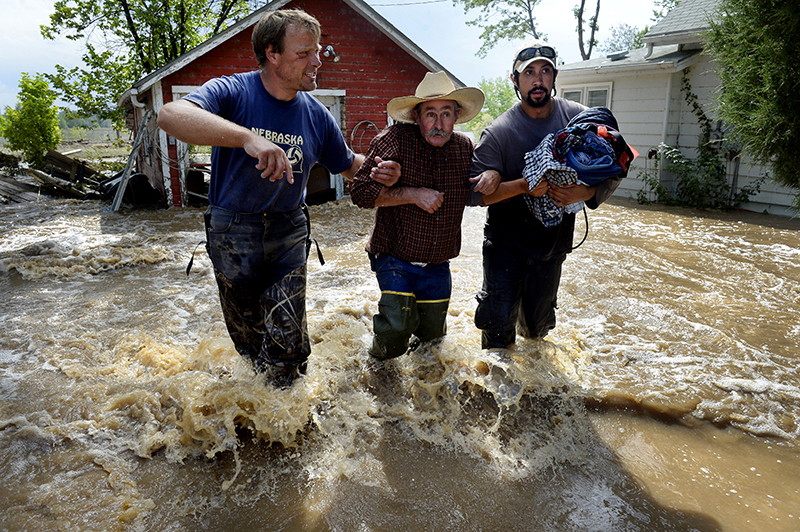 Dan Hull, center, is assisted by Brian Marquardt, left, and Scott Johnson after rescuing Hull's two cats and gathering some items from his flooded home in Hygiene, CO. The 59-year-old truck driver was shaken after seeing the inside of his home for the first time since he had been saved by rescue teams earlier in the week. The Flood of 2013 was remarkable for its breadth and duration. More than 1,500 square miles in 17 Colorado counties were inundated. Nearly 2000 homes were destroyed and hundreds of miles of roads were damaged.